The Hitachino Next Beer owl logo. 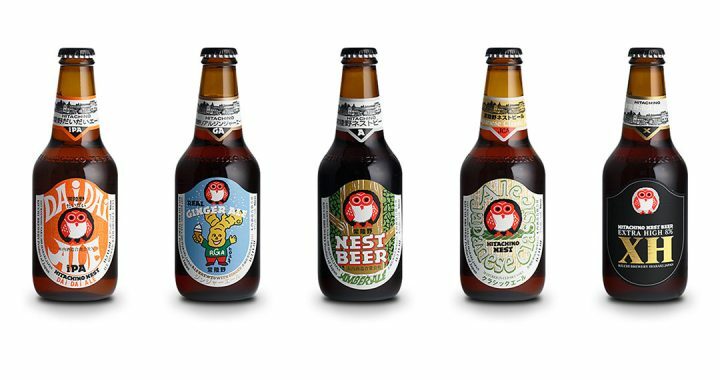 Today on Brew Ha Ha, we meet Uichi Kiuchi the founder and brewmaster of Hitachino Nest Beer. Naoko Kiuchi, his daughter, is also here to talk about her work in marketing Hitachino Nest Beer. Pete Foppiano is sitting in for Steve Jaxon today on this special Tuesday edition of Brew Ha Ha. Mark Carpenter introduces today’s guests by telling how Herlinda Heras invited him at the last minute to visit some breweries with today’s guests from Japan. It’s the kind of day that makes him glad he’s a brewer. Vinny Cilurzo at Russian River Brewing showed them the new Windsor facility. By the way, Vinny and Natalie Cilurzo will be in the studio on January 31 with the ONLY growler to leave the facility with the new Pliny the Younger. Uichi Kiuchi’s family has made sake for 200 years but 30 years ago he felt frustrated with the sake business so he started making beer. He used to visit California to play golf and visit wineries. Once he tasted a micro brew and was surprised that this kind of beer was becoming popular and he became interested in making beer. The sake business was hard, you could make good sake and still not have good sales. In 1994 the Japanese brewing law changed in ways that allowed small brewers to open. His parents were opposed at first but after one month they said yes. Naoko Kiuchi just graduated in marketing and will work for her family’s company. They have an upscale pub in San Francisco with 10 of their family’s sake, and their beers, and they import Wagyu Beef from Japan. She will be doing events at their San Francisco location for sake, beer and soba noodles. Uichi has a soba restaurant in Japan and he would like to introduce soba culture to California. Soba is made from buckwheat flour and water. They serve them cold in the summer time. Their San Francisco restaurant offers Wagyu beef and American beef and Uichi Kiuchi says you can sample the difference in taste and in price. Uichi Kiuchi remembers tasting Anchor Beer on a visit to California in the 1980s. Hitachino Nest Beer makes a Red Rice Beer that Mark says had nice color and great body. They visited Russian River Brewing in Windsor where they saw the new cool ship, which Mark and Herlinda describe. Uichi says that the white beer is their flagship brand but they brew a lot of other flavors.